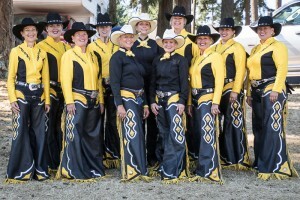 Wearing their colors of Bright Yellow and Black or the Patriotic colors of Red, White and Blue, the Mane Attraction Rodeo Performance Team provides an exciting addition to rodeos, parades and competitions. Spectators applaud the precision of the pounding hooves of the fast paced horses, carrying flags and exploding in the arena to the loud, upbeat music. Always a crowd pleaser, the Mane Attraction provides color and flash to any event! The team is gearing up to perform for our 25th season in 2019. Our team rides in competitions, exhibitions and rodeos throughout the Northwest. We are proud to have ridden in the 2014 and 2016 Northwest Equine Expo in Albany, Oregon. 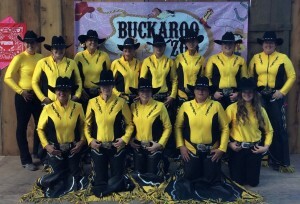 We have always made a commitment to the members that the focus would be a social riding group who desires to perform at rodeos and competitions and have a great time, but also has a winning attitude! We have been very successful at attaining these goals, and wish to continue to do so. We are a competitive women’s drill team, always looking for experienced riders with horses that have intermediate to advanced training. Riding drill takes a horse with the willingness to ride closely with other horses, making quick turns, riding at high speed and stopping quickly. Cantering slowly is also part of the drill. This is often an unnatural thing for a horse to do, and the horse has to be willing to participate in order to make a good drill horse. Most of the women on the team have been riding drill for a number of years, so there are many mentors to help new members. Some of our regular performances have been the Salem Rodeo in May and the Eugene Pro Rodeo in July. 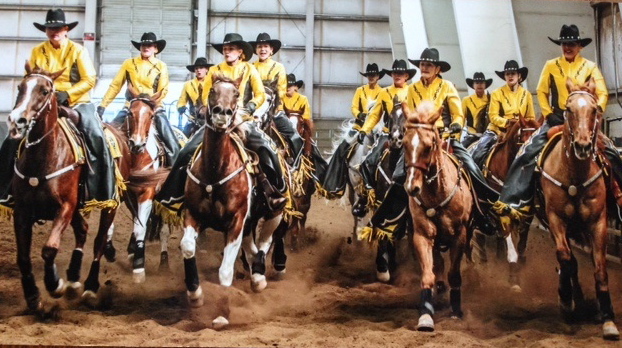 We also compete in Reno at the Western States Drill Competition in June, and at events in the Pacific Northwest, including the Oregon Women’s Drill Team Association State Meet and the Oregon State Fair in Salem every September. If you feel you have what it takes to be a part of our team, contact us!